No records response from the General Services Administration in response to our request for communications with anyone at the Trump Organization during the government shutdown. American Oversight sought these communications because access to the tower in the Old Post Office Hotel remained open during the government shutdown. American Oversight's lawsuit filed against General Services Administration and the National Park Service to shed light on the decision to use federal funding to re-open the Old Post Office Tower during the longest government shutdown in U.S. history. FOIA request to the General Services Administration seeking communications of senior officials regarding the operations of the Old Post Office Tower during the partial government shutdown that commenced on December 22, 2018. FOIA request to the General Services Administration seeking communications between senior officials and the Trump Organization on or after December 15, 2018. 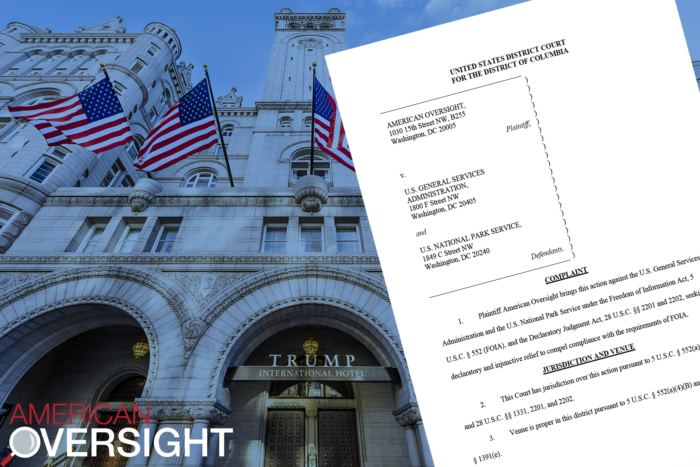 The request seeks to learn whether agency officials communicated with the Trump Organization about the operations of the Old Post Office Tower during the partial government shutdown that began on December 22, 2018. FOIA request to the General Services Administration seeking records regarding the source of funds for the operation of the Old Post Office Tower during the government shutdown that began on December 22, 2018, as well as records of any legal analysis of how the lapse in appropriations would impact those operations.